In sump skimmer. Powered by an Aquatrance 3000. Built with high quality acrylic. Gate valve allows for more precise control of water level. ½” clearance required to remove collection cup for easy cleaning. Dimensions: 15.6" x 10.25" x 23.75"
Manufacturer rates skimmer for tanks up to 250 gallons. I absolutely love this skimmer. I have owned it for two years. It does a wonderful job and is very easy to dial in. I haven’t had so do anything to it, except empty the cup. Solidly built, reliable and easy to use. I have this on my 150 and it’s perfect. Have had this skimmer for about 2 years or so now, still working great. I have not noticed the increase in sound as other have described. I gave it 4 stars because I don't see an easy way to clean the lower section after you remove the pump and upper section. The lower section seems sealed. I can run water thru it but thats about it. In 2 years it's not been a problem so far. Received this skimmer yesterday, and it's essentially twice the size of my old Aquamaxx EM200. It's a beast. It's quiet so far, but I'm just on my 2nd day of breaking it in. I have a big foam head inside the skimmer body, and you can see crud that it's collected on the walls. Assembly was easy, and did have to trim the air hose down some. The noise was my biggest concern. Going from the Aquamaxx, with the Sicce pump, it truly was silent or very close to it. The Classic at this time, is as quiet, but appears to be more efficient because I'm sure that I'm drawing in a lot more air into this one vs the EM200. After 6-8 months, will revisit this review. Only 4 stars for now. May bump to 5, we'll see. Own this for 3 years and it's absolutely a beast! This is an awsome skimmer!! Made very well and once you get it broke in and dialed in I've never had to re adjust it. 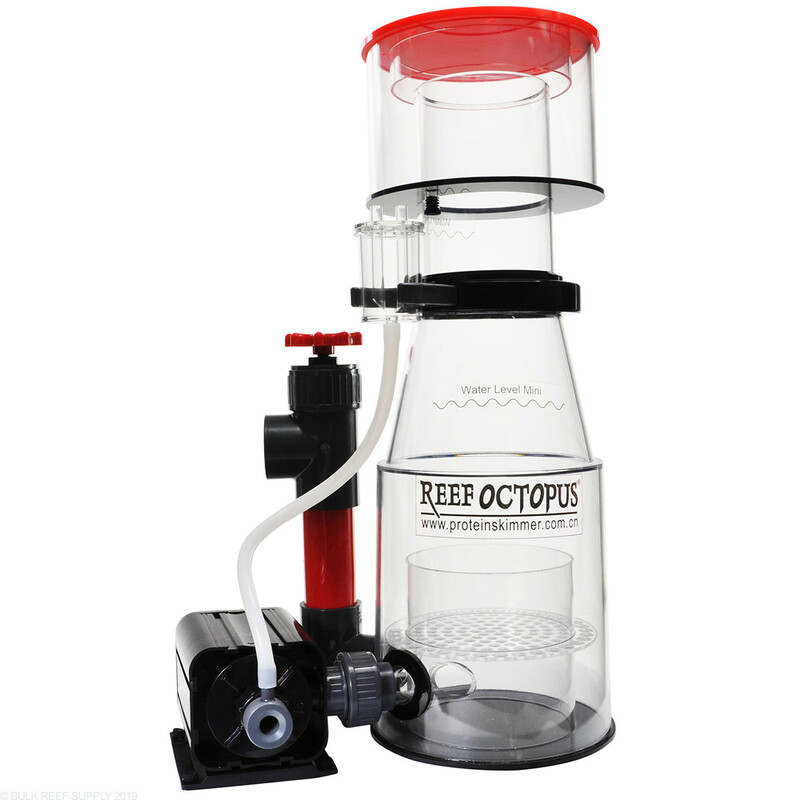 I have only owned Reef Octopus skimmers, so I may be biased, but this beast is great. I cleaned and vinegared the entire setup at 6 months and a year, and it continues to impress me. In smaller tanks I had the 4: skimmer, and loved it, so when I bought my 155, I knew I would get another one. 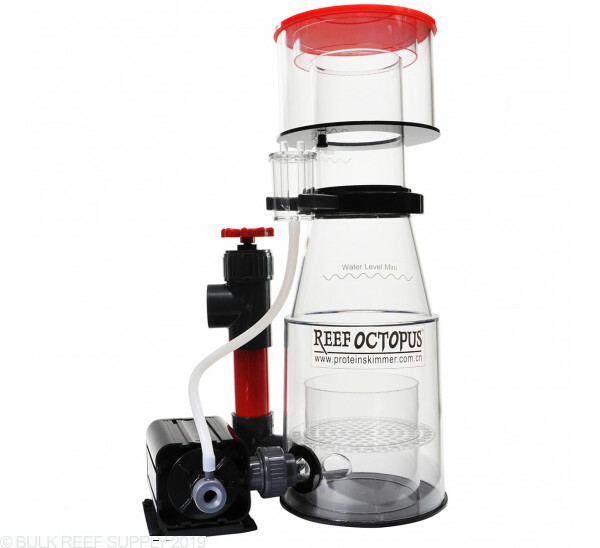 I have owned the 4" 6" and now the 8" reef octopus int skimmers. They are quality made, affordable and skim like crazy!!! one of the only skimmers with gate valve in this price range. I recently upgraded to the 8" after running the 4" for some time. I upgraded my tank and added biopellets so I wanted the larger sized skimmer. So far so good as i'm still breaking in now. Pump rattles a bit, but for me it's not a problem in my basement sump. Running this on about 110 gallons of system water. Great skimmer in my opinion. Started skimming yesterday and its already pulling out some skimmate.. Relatively quiet, easy to tweak.. Definitely need a decent size sump, i put mine in a 20 gallon long tank, that i partitioned. It has a pretty big foot print, and is pretty tall, but it fit nicely into my sump under a 75 gallon stand. I have fead some of the bad reviews on this skimmer, and have not personally run into any of the complaints., and i will say that my corals have noticed a difference already. I was not previously skimming in this tank, because i didnt really have any kind of bioload, but recently have been adding more livestock, and the skimmer is working as advertised well before the stated break in period. The first year this skimmer was pretty quiet. Now that it is 13 months old, it has become noisy. Very noisy. I hope to find a quit one soon. They come with a gate valve. They used to come with a wedge pipe years ago but have been gate valves for quiet some time now. What is the water depth range required for this skimmer? We recommend a water depth of 7.5 - 8.5in for this skimmer. Have a great day! Do you sell the replacement impeller for the pump included with this skimmer? Hello, what is the minimum sump size to properly house this skimmer? If you have the room for it, I would personally go for the 200INT. The space saving skimmers are always a bit of a compromise on performance in order to save space, and as long as that's not a limiting factor, you'll find it's easier to maintain the skimmer pump and you get more ideal performance from the classic skimmers with externally mounted pumps. What are the differences between this model and the classic 202-s model? The difference will come down to foot print size. Both will be designed for 250-150 gallon systems. The 202-s has an internal pump while the 200int has an pump outside of the skimmer body. Feel free to let us know if you have any further questions! The manufacturer's information says 41watts on the included pump.